Are you in the market for a shiny new turntable? If so, that makes you a very lucky individual, as there’s never been a better time to be in the market for a record player. I’ll assume that if you’re this far along in your search, you’re already familiar with the need to know minutia of buying a new deck. And if you’ve come this far, you’ve almost certainly encountered the Audio-Technica name. There’s good reason for that—they’ve been making turntables for decades. But Audio-Technica understands that, sadly, not everyone can afford to drop $1,000 on a beautiful new turntable. And so, at just $129, none of the decks in the Audio-Technica family fit the bill better than their fully automatic AT-LP60-USB (we’ve already reviewed the regular AT-LP60 here). But at that price, the question is simple—can you really get genuine Audio-Technica quality? That’s exactly what we’re going to find out, as we review the Audio-Techica AT-LP60 USB turntable. First and foremost, you need to understand that at this price range, you are going to have to make sacrifices in quality. Audio-Technica may be happy to put a reasonably priced deck on the market, but they’re not giving away top-shelf features with this turntable. Tonearm – As I mentioned, the AT-LP60-USB is a fully automatic turntable, meaning the tonearm will position itself at the beginning of the record as soon as you press start. There’s a super-easy switch to move between 12” and 7” records, as well (for those that don’t know, 12” records spin at 33 RPM, while 7” records spin at 45 RPM. On the AT-LP60-USB, there’s a simple button you can press that switches the speed of the turntable to either play 12” records or 7” records accurately). And truthfully, this is a great feature for the casual listener who doesn’t want too much fuss in their spin-time. But, if you’re a seasoned pro and a collector of 10” records, you still have the option to operate the tonearm manually.The tonearm itself is quite simple. It’s made of aluminum and is straight (not curved like tonearms on other tables), but does not offer features like counterweight, anti-skate or height adjustment. All that means is that you’ll have little control over how much pressure is on your favorite records, and even less control over skipping—which can lead to scratches.And just on a knit-picky note from me—there’s no clip to hold the tonearm in place. That makes moving your deck a potentially dicey proposition. Cartridge & Stylus – In your search, you have likely noticed that many turntables at this price-point have ceramic cartridges that you cannot upgrade. The AT-LP60-USB sets itself apart by including an dual-magnet cartridge, which is pretty great.But while magnetic cartridges offer better audio signal, they also produce a low-level signal and are hyper-sensitive to vibration. You’ll want to be careful and position your deck in a low-traffic area. The good news is that the cartridge is manufactured by Audio-Techinica, and they have a solid reputation for building solid cartridges. The bad news is that without weight/skate control, you will not be able to adjust the tracking force—so you may not get as much out of the cartridge as you’d like.Further bad news is that you cannot upgrade the cartridge. But you can upgrade the stylus. And while the spherical-diamond tip stylus that comes pre-fitted is better than most, you’ll likely want to upgrade if you’re looking for a fuller sound. 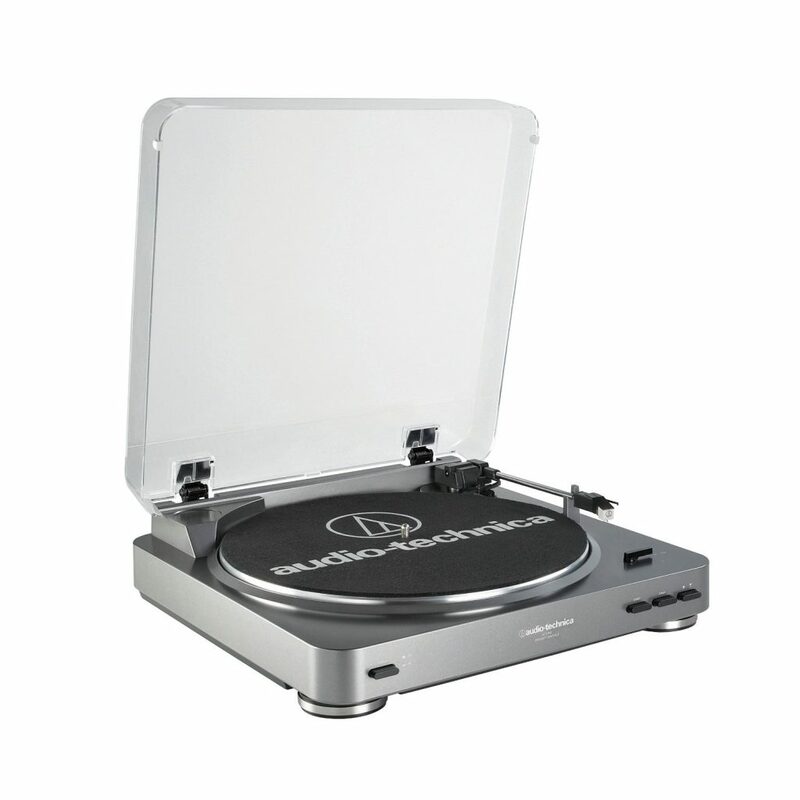 Platter & Motor – One of the key selling points for the AT-LP60-USB is that it includes an aluminum platter. That’s a huge upgrade over the cheap, plastic models that come with most turntables in this price-range.That’s important for one very big reason—aluminum is heavier than plastic. A heavier platter equals less vibration. Less vibration translates to less skipping. And less skipping means purer tracking and depthThe AT-LP60-USB operates with a belt-driven motor. And while the motor runs relatively quiet, it is noticeable in quieter musical moments—so keep that in mind.Now to my favorite feature on this record player—the push button speed changing (as I mentioned earlier). 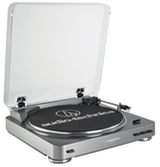 Like most turntables, the AT-LP60-USB runs at either 33 RPM or 45 RPM. Unlike certain higher end decks, you do not have to lift the platter to change speeds. All you need to do is push a button. If you’re looking for ease-of-use, you will not find a deck on the market more friendly to its users. Amp – And now for some great news—the AT-LP60-USB comes with a built-in switchable phono pre-amp. This allows you to connect directly to a rack stereo system, your home computer or powered speakers.No separate pre-amp or fancy cables required. Just plug in and spin.Not only will this option save you the minor headache of sorting out how to hook into a pre-amp, it will also save you a fair amount of cash. 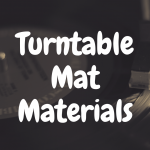 This is an invaluable option for price conscious veterans in the vinyl scene, as well as those completely brand new to the hobby. And finally, let’s move onto Software. Software – Yes, the AT-LP60-USB features USB connectivity that allows you to digitize your vinyl collection—which may or may not matter to you. Just remember, if you’re buying a lot of new records, they probably include a digital download anyway.That being said, I do have a few records in my collection that I would like to be able to carry with me, so I understand the draw of digitizing. Beyond that, the ability to be able to transfer your records to computer or CD is really important if your record is rare. 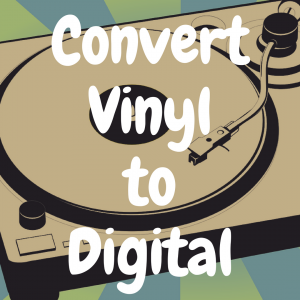 If your record is invaluable to you, and you know it would cost you an arm and a leg to replace it, it might be worth it to copy the record to CD.On top of that, there are still tons of records that were never converted to CD or MP3 files. 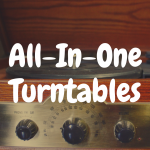 There are also a ton of 45s (or 7” records) that were released by unheralded artists decades ago that have never seen a second life on any other musical medium beyond records. So if you have a copy of Yvonne Carroll’s “Gee What a Guy” or “A Little Bit of Soap” on a 45, it would be a good idea to digitize it rather than rely on a streaming service like Spotify to maintain it in their vast (and always changing) music library.If you do choose to convert your vinyl to CD or MP3, the award-winning Audacity software that Audio-Technica has paired with the AT-LP60-USB is as good as your going to get. And it can be downloaded to your PC at no cost too. With all that said, the most important question still looms—how does this turntable it sound? The short answer is pretty darn solid. Look, you’re not going to get a true audiophile experience out of any deck at this price range. That’s just the honest truth. 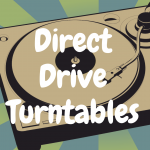 The AT-LP60-USB is a starter turntable—a great record player for a beginner that wants to dip his or her toes into the vinyl waters to see whether or not this hobby is for them. But the AT-LP60-USB does have enough quality in its bones—the platter/cartridge/pre-amp, etc)—to give you the pure, warm sound you’re looking for out of your favorite records. But just like with any audio device, it’s only as good as the components you use it with. If you don’t already have a system to plug into, you’ll want to take some extra time looking into speakers for your deck. 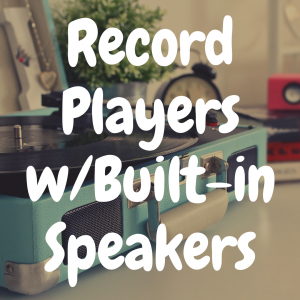 Since you’re saving so much money on this turntable, you should think about reinvesting that money on your speakers and ensure you’re getting the most out of your audio experience. That being said, you’ll also want to consider where you place your turntable. Not purely for logistic reasons—low traffic to avoid vibration, located to best project sound, etc. No, wherever you put you’re deck, it will become the focal point of that room. And you will be judged on its looks. That’s not likely to be a problem with the AT-LP60-USB, as it has clean lines and a minimalistic design—but it’s something to consider. So, how’s the AT-LP60-USB stack up to the competition? To that I would simply respond that, at under $150, there really isn’t too much competition. Of course, you can scoop up the non-USB version of the AT-LP60 for just under $100, and if USB is not a make or break feature, you really should consider that option. It’s literally the exact same player—just without that USB feature. Now, if you’re finding yourself less than impressed with this stripped back version of Audio-Technica quality—and you’ve got a few extra bucks to spare—you might want to take a look at the AT-LP60-USB’s sleek second cousin, the AT-LP120-USB. It’s built tougher that the LP60-USB and boasts upgrades aplenty. Yes, the AT-LP120-USB features the same USB connectivity, an internal phono pre-amp and an aluminum platter. But for the extra money, the LP120 comes equipped with a S-Shaped tonearm complete with counterweight, anti-skating control and even tonearm height adjustment (not many audiophile tables offer this tonearm option). For that extra money, you also get a pro-graded, fully upgradeable cartridge and head shell and a quiet high-torque, direct-drive motor (no belts needed!!). If that weren’t enough, the Audio-Technica has added quartz-driven high accuracy pitch control so you can fine-tune your listening experience. And you can control it all with the same push button efficiency of the LP60-USB. Of course, with all those fancy bells and whistles, the LP120-USB is missing one key feature that its little buddy boasts—automatic function. If you want the needle to drop on your LP120-USB, you’ll have do drop it yourself. 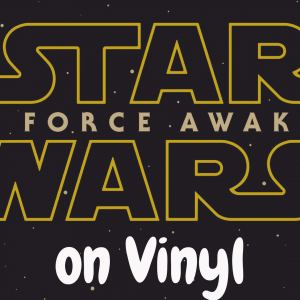 Some newcomers to the vinyl scene may not be ready to take that task upon themselves. For that matter, think about whether you really need all those bells and whistles. General rule of thumb is this—if you don’t know what those features actually do, you probably don’t need them—at least not right now. You can, after all, always upgrade to a higher quality (and more advanced) turntable in the future. All things considered, the Audio-Technica AT-LP60-USB comes highly recommended. With a blend of quality components and user-friendly design, it’s simply the best deck you’ll find at this price point. Of course, if you’re looking for a true audiophile experience, you’ll need to look elsewhere. 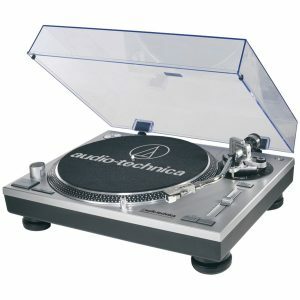 But if you’re looking for a solid, everyday player that’s perfect for people brand new to collecting and playing vinyl records, look no further than the LP60-USB from Audio Technica. Are Crosley Record Players Bad for Beginners?